The week started at SPX 2875. After a gap up opening to start the week, the market rallied to new highs on Monday, Tuesday and Wednesday. Near the close on Wednesday the SPX hit 2917. After that it pulled back into Friday, closing at SPX 2902. For the week the SPX/DOW gained 0.8%, and the NDX/NAZ gained 2.2%. Economic reports on the week were mixed. On the downtick: consumer sentiment, the Chicago PMI, Case-Shiller, pending home sales, plus jobless claims increased. On the uptick: personal income/spending, consumer confidence, Q2 GDP, and core inflation. Next week’s report’s are highlighted by the ISM’s and monthly Payroll. Best to your three day weekend! The SPX, NAZ, NDX, TRAN and R2K all continued to make new all-time highs this week. We continue to track the DOW, NYSE and DJW index awaiting their new highs. At this week’s highs the DOW was 1.7% away from its all-time high, the NYSE 3.7%, and the DJW 4.7%. Still expecting all three of these indices to reach all-time new highs before the bull market concludes. Four point seven percent added to this week’s SPX high equals 3053. Generally in line with our mid-2016 target of SPX 3000+ by 2018+. The long-term count continues to unfold as expected. A Major wave 1 bull market underway since early-2016 at SPX 1810. The market has risen 61% in the 30 months since that low. The Major wave bull market consists of five Intermediate waves. Int. waves i and ii completed in the spring of 2016, and Int. waves iii and iv completed in the spring of 2018. Int. wave v has been underway since April 2018. Best to your weekend! The current Int. wave v uptrend started in early-April at SPX 2554. Since then it has risen 14% in nearly 5 months. It beginnings were quite choppy as noted in the daily chart below. Nevertheless, around mid-June it completed Minor wave 1 at SPX 2791 and pulled back to Minor wave 2 at SPX 2692 by late June. Minor wave 3, of this five minor wave uptrend, has been underway since that low. On the SPX hourly chart below, we counted Minor wave 1 as five Minute waves with an irregular Minute ii. We are expecting Minor wave 3 to also unfold with five Minute waves. Minute waves i and ii completed in early August at SPX 2863 and 2802 respectively. And, Minute wave iii has been underway since that low. Minute wave iii has rallied pretty much straight up since the Minute ii low. There have been several pullbacks, but none over 20 points until this last one from Wednesday’s high. Thus far from the SPX 2802 low: 2819-2806-2850-2834-2873-2854-2917-2892? It’s clearly a strong advance as none of the pullbacks have overlapped the previous high, and market breadth has continued to climb to new highs as well. Once this pullback concludes we’re expecting a rally to new highs, probably the OEW 2929 pivot range, before Minute iii could possibly end. More than likely, only wave 1 of Minute iii would conclude at that point. 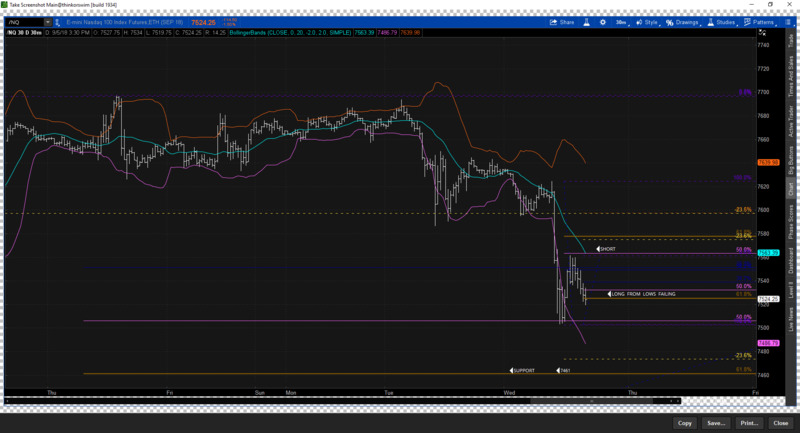 Short term support is at the 2884 and 2858 pivots, with resistance at the 2929 pivot. Short term momentum ended the week at neutral. Best to your trading! Asian markets were mostly higher on the week and gained 0.7%. Europeans markets were mostly lower and lost 0.6%. The DJ World index gained 0.6%, and the NYSE gained 0.1%. Bonds continue their uptrend but lost 0.1%. Crude looks like it is in an uptrend and gained 1.6% on the week. Gold looks like it is in an uptrend as well but lost 0.5%. The USD looks like it is in a downtrend and lost 0.4%. Monday: Labor day holiday. Tuesday: ISM, auto sales, and construction spending. Wednesday: Trade deficit. Thursday: ADP, jobless claims, ISM services and factory orders. Friday: monthly Payrolls. Rather surprised OEW charts, like the SPX are already several days old. It would appear, times have changed…. The Dow is starting to catch a bid and move up. Tony, any thoughts on today’s price action. and where we stand in the EW count?